﻿ Internet and networks Windows 10/8.1/7 Desktop Sidebar Gadgets. All free. It is simple gadget for visualize your internet connection details. You no need to open your internet settings to see Internet signal, your computer's IP addresses, the traffic speed and usage. Just put one look at this gadget. You can view many information directly on your desktop without installing other network monitoring tools. If you have problem with network connection, gadget play special sounds for indicate this. 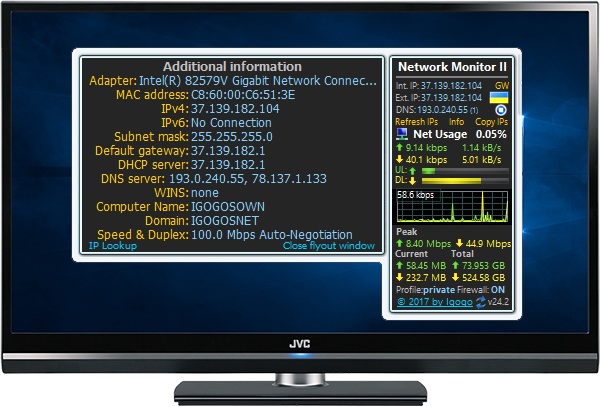 Try Network Monitor II for keep an eye on your internet connection. Support 22 different languages. There are many tools available to monitor the connection to your website, server, domain or IP address. Ping Monitor is a desktop gadget for Windows 10 and is easy to access at all times, and if needed it can stay in the foreground at all times. It is capable to monitor up to fifteen servers locally, and/or remotely. This gadget will ping each one of the servers at an interval that is set by the user. Monitoring state for each server you can paused or continued. Ping Monitor supports both IPv4 and IPv6 addresses. For your convenience, Ping Monitor currently supports 19 languages. Designed as a simple desktop gadget for Windows 10, Ping Tester can send ping requests to any domain or IP address (support both IPv4 and IPv6 addresses) without using command prompt and displaying the success rate of the requests once the test is done. This gadget will ping server at an interval that is set by the user. Very easy to setup. Connection Watcher is a small, yet reliable tool, which can analyze the state of your connection to Internet by means of connect to special, 100% live site, that you set in settings. The gadget is run on your desktop and indicate the link status with colored markers. Also Connection Watcher can play an alarm and/or execute special program when the connection is lost or a confirmation sound and/or perform a program when the link is established. 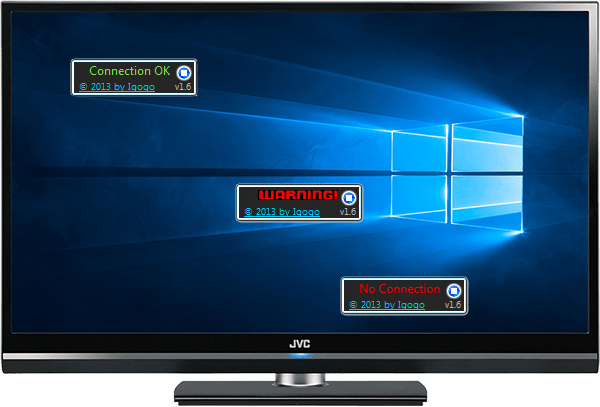 NIC Watcher is a simple and useful Windows 10 gadget does one simple thing - monitor your Network Interface Card (NIC) your computer is equipped with. At a glance, you'll be able to tell if your one of eight pre-specified cards is working and connecting as expected. NIC Watcher can be instructed to play a custom alarm sound if the connection is lost and/or play a confirmation sound such as a newly established connection or a change in the connection status.